So, as most of you know, I'm not so much a traditional scrapbooker kind of girl. Sometimes I wish I were but I haven't the passion for it. Instead, I'm obsessed with archiving our lives in a different sort of way. Like, you know, ONLINE. I also have a five year journal where you write a snippet from your day everyday. I wrote a post about my calendar obsession and this five year journal here. I love the blogging. LOVE IT. Clearly. Attend parties around it. But, sometimes, I think the day to day gets lost. Even on twitter. Which I also love dearly. (But which I often censor myself.) Like sometimes I don't actually NEED to share with you that Karl and I got into a fight about macaroni and cheese or that I took a package to the post office or did a FOUR HOUR DEEP CLEAN (Who are we kidding? That never happens! Nap time is for blogging and reading books, right?! And a four hour nap? That's just bonkers.). Plus, let's face it, not everything about my life and, more specifically, the people in it is shared on this blog. But, I think, sometimes the little details are the ones I might like to remember later when Nate's childhood seems a blur and I can't remember who was over at the house sharing a bottle of wine on Friday nights and when I'VE FALLEN AND I CANT GET UP. So that's why I love my little 5 year journal. I'm currently in a state of conflict about it b/c I found (OKAY FINE Karl found) this site, ohlife, and it appeals to EVERY BONE IN MY BODY. Basically, it sends you an email every night and you reply with a few short sentences about what you did that day. Then, it's archived and with every daily email you receive, it sends you a note about one of your archived posts. It's free and I want to do it real bad, but I'm afraid I'll give up on my little journal guy and I, believe it or not, do actually like using pen and paper occasionally! What do you think? Would you use it? Is it TOO MUCH? Either way, I thought it was worth THE SHARE. i think that sounds cool - but their website scares me a bittle! it's so bare-bones and new...seeming. idk! it's an awesome idea. i would love it if lots of things would email me each day to remind me about them. SURE I COULD USE OUTLOOK OR MOBILE ME. BUT I DON'T. I'm totally signing up. But then again, I don't keep a paper journal, so this is just gravy. Hm... Sounds cool, but I dunno. It reminds me of a long distance relationship (which I unfortunately had) where you dont talk most of the day and then try to remember "I need to tell him ___ when we talk tonight!" By the time you talk, you cant ever remember what you wanted to tell him. It's frustrating. I feel like it could get like that. 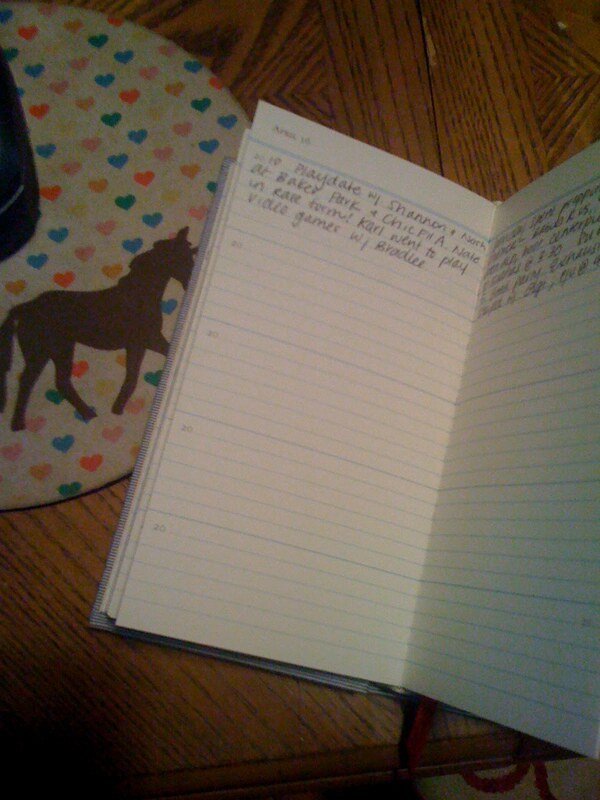 My lonb distance relationshipy daily journal. hahah! I'm OCD. I know this. Why are you my friend? LOL! ack! i started it last week and i kind of love it. i feel the need to be concise, which is not something for which i'm exactly known, so i sort of love it already. Four hour + nap = BONKERS. The online email journal sounds aaahhhhsome. I love the idea...especially since I have never ever managed to keep a journal longer than two weeks. Considering. Seriously considering. P.S. I have been wanting to start the third Lizbeth Salander book for two weeks, but I know it will involve totally checking on out the fam for a day or two. But it's sitting there on my bookshelf. STARING. AT. ME. I couldn't paste stuff in this so it wouldn't work - plus there is something to a pen and paper that shifts my perspective. Don't leave your little 5 year journal behind - your heart and mind need it.